As portions of the U.S. endure scorching drought, livestock owners struggle to locate feed supplies. 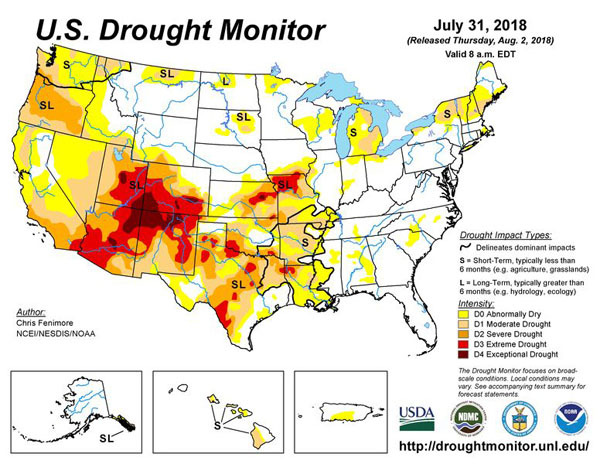 Missouri, Arkansas, Kansas, Oklahoma, Texas, Louisiana and several more western states range from D0 (abnormally dry) to D4 (exceptional drought). For brothers Alex and Chad Nuelle, their Higginsville, Mo. farm is facing hay and water shortages. They might need to start trucking in water-which is a first for their farm. Right now, the Nuelles are feeding about 500 head of beef cattle and expect to add anywhere from 300 to 400 more this fall. While that will be an added cost, they think it’ll pay off in the long run as they’re seeing more ranchers consider selling out because cattle prices are depressed, and hay prices are through the roof. In mid-Missouri, large round bales are selling for anywhere from $80 to $120, Alex says. “We chopped all of our corn acres for silage and we’re buying another 80 or 90 acres, aiming for 2,400 to 2,600 tons [of silage] when we’re done,” he explains. In a normal year many farmers see in around 180 bu. per acre in corn, this year yields are low-and incredibly variable. In Higginsville, Mo., and farther north in Missouri, farmers might be money ahead to chop corn for silage, Chad adds. This year their farm is averaging 17 to 18 tons per acre and they’re paying $30 per ton for silage, resulting in $540 of value. Last year they were getting about 22 tons per acre at $40 per ton. Silage is in high demand this year. The Nuelles are short a couple hundred large square bales for their customers, and another 400 large round bales for their own operation, so they’re leaning more on silage than normal. Parts of Missouri received rain Monday night and the Nuelles saw about 1″ fall on thirsty acres. This rain might not help corn much, but it could go a long way toward soybeans and building up fall pastures. Farmers that missed rains are ready to bale soybeans, and a number that might not have access to silage equipment have already baled corn. The farms in northwest Missouri are in an even tougher spot. If rain doesn’t start falling to save soybeans, many farmers might find themselves baling the crop. And if rain doesn’t fall, it might force some farmers to make tough decisions. “I think if we don’t get fall rains for beans and pasture we’ll see a lot of guys selling [cattle],” Chad says.